There’s a new look along the streets of Hernando County. Big blue garbage bins are now what people will put their trash in. SPRING HILL, Fla. — There’s a new look along the streets of Hernando County. Big blue garbage bins are now what people will put their trash in. Roderick Garcia lives in Spring Hill and says he's happy with Republic Services’ new trash pick-up method that is supposed to make pick-ups faster and safer for workers. "I’ve been out here for a lot of years and we’ll offer (the workers) water and stuff because they’re tired, and they’re drenched in sweat. With this it's more efficient, it's faster, it's safer," said Garcia who says he doesn't mind paying a little more each month for the efficiency. But some people are concerned about the new system. "If there’s anything loose in your trash can it’s going to be out on the road," said Sara Chase. 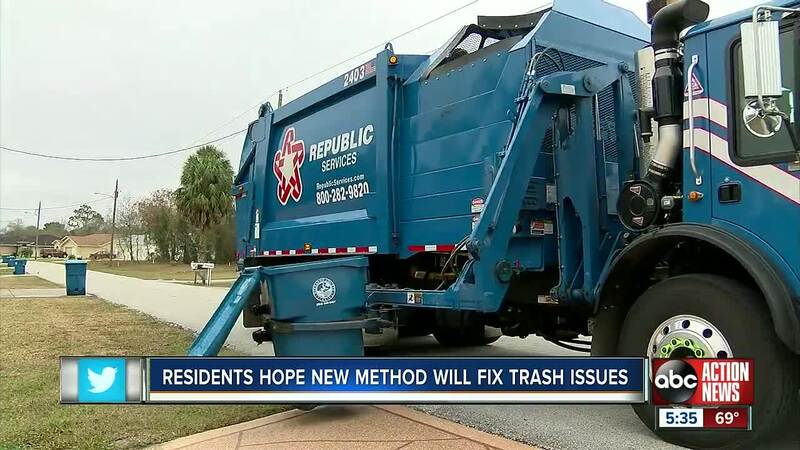 We’ve talked to Sara Chase several times about Republic Services missing pick-ups in the eastern part of the county and just last February Republic Services was fined more than $135,000 by Hernando County for more than a thousand missed streets in one month. But Chase says pick-ups has been much better since we spoke with her a few months ago and hopes the new bins will help with that. Though she says many people are concerned with the size of the new bins. "A lot of old people live where I live in Ridge Manor and they can't take these trash cans out," said Chase. Garcia, on the other hand, says he thinks moving them won't be a problem for people. "It's very simple, smooth, and easy," said Garcia. Regardless, people are hopeful that they will make garbage pickup better for the whole community. "I hope it works since they're implementing it throughout the whole county," said Chase. The county is asking for people to be patient this week because some routes have changed, workers are still being trained, all while kinks are being worked out in the first week of the new method.